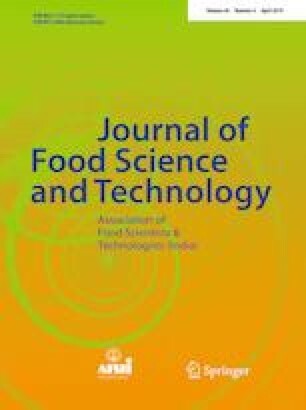 Exopolysaccharide (EPS) produced by Weissella confusa KR780676 from an Indian fermented food (Idli) has been characterized as galactan in earlier report. In this study, the galactan EPS was irradiated at different doses (0, 4, 8, and 16 kGy) using 60Co as γ-source and effect of γ-irradiation on physico-chemical and antioxidant potential of galactan EPS was studied. Color and flow properties showed moderate change after the γ-irradiation treatment. Particle size analysis and scanning electron microscopy exhibited significant breakdown of the EPS particles into smaller average hydrodynamic diameter size from 495.54 to 198.44 nm with increasing irradiation doses. Overall, pH showed decrease, while the water activity showed an increasing trend with the increasing irradiation dose. No significant effect was observed in the functional groups of EPS as revealed in the FT-IR spectroscopic analysis. After the treatment, semi-crystalline nature of the EPS changed to amorphous as shown in XRD analysis due to the breakdown. Antioxidant activities of galactan EPS increased marginally after the treatment. However, hydroxyl radical scavenging activity increased significantly from 48 to 67%. Changes in physico-chemical and antioxidant properties of galactan EPS with γ-irradiation treatment altered the functional properties of EPS positively, making it more suitable for wider application in the food industry. The online version of this article ( https://doi.org/10.1007/s13197-019-03608-w) contains supplementary material, which is available to authorized users. Authors Digambar Kavitake, Sujatha Kandasamy and Palanisamy Bruntha Devi are grateful to University Grants Commission, New Delhi, India for providing financial assistance in the form of Junior Research Fellowship and Post-Doctoral Fellowship. Pondicherry University, Central Instrumental Facility is acknowledged for availing the required facilities.